At our Depression Ink locations we offer customizable tattooing that fits the needs of our clients. Bring in your own pictures, choose from options on display in the stores, or get some ideas from the artists' portfolio's. Give us a call or come in and see us for a consultation any time. We're more than happy to work with you in designing exactly what you want; after all, you are the one wearing the tattoo for the rest of your life! We would also like to remind all of our clients, and our potential clients, that we maintain a cleanliness standard comparable to no other. All of our needles are pre-packaged and sterile and everything that touches you (gloves, bibs etc.,) is fresh out of a box, never having been used on other clients. We pride ourselves on both our quality of work and the quality of the experience for our clients so when it comes to cleanliness let us put your mind at ease: We are regularly inspected by health officials for both your safely as well as our own. 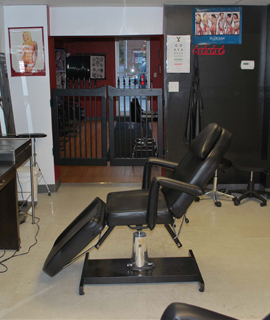 In fact our locations are so clean that they have been used by health officials as the model standard for tattoo shops in Ontario. We offer both piercing services as well as jewellery replacement services. Come in and have a look at our selection of jewellery or bring in your own pieces for replacement. We are experiences piercers willing to pierce in most places; however, it might be best to give us a call if you want something a little off the beaten track! To note: All new piercings provided by our staff must be undertaken using our jewellery only. This is the only way we can verify that it is sterile and safe for use. If you are 16 you are able to be pierced without parents consent as long as you have ID to prove it. If you are under the age of 16 you will need to bring a parent and both of you will need some form of ID. As for Tattoos you will need to be 18 years old with ID to be tattooed. If you are under the age of 18 you will need to bring a parent and both of you will need some form of ID. Due to high demand for our artist’s, bookings are preferred. Although E-Mail is helpful to those trying to get questions answered, appointments will not be made. To make an appointment you must call the shop and after a date has been set a deposit must follow. It is very difficult to give quotes without seeing the design. Price is influenced by detail placement and size. We are happy to work with your own design. If you have your own design and would like a quote feel free to drop by the shop or E-Mail a copy. Don’t forget to include contact details, rough size ( in inches ) and body placement. We also have a large collection of designs and if you still can’t find what you want our talented staff is happy to create a custom tattoo for you.